ISLAMABAD, Dec 5 (APP): Advisor to the Prime Minister on Foreign Affairs Sartaj Aziz Monday said under current situation, it was a remote possibility to expect any breakthrough in Pakistan-India frosty ties. But, he stressed that ultimate resolution of all outstanding issues between the two neighbours was in resumption of Composite Dialogue. In an interview with a private TV channel, he said whipping up an anti-Pakistan rhetoric by Indian Prime Minister Modi suited him ahead of elections during February next year. 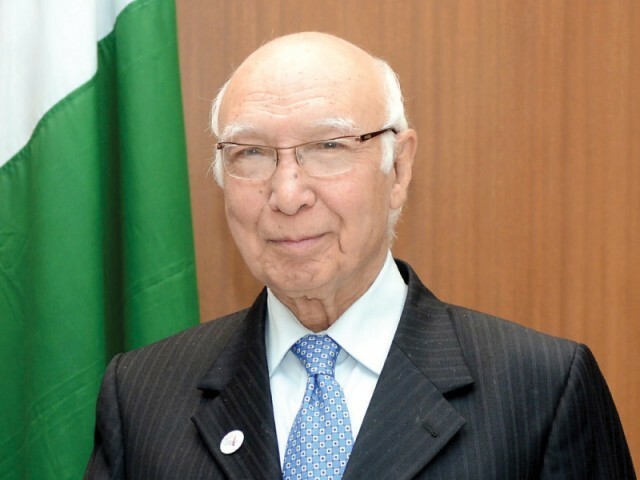 To a query regarding opening of any window for meeting of National Security Advisors of the both countries in the near future, Sartaj said whenever it would happen, the foreign secretaries would also feature in the talks, ranging over all the issues including the core issue of Kashmir. For the time being, Pakistan desired to lower the tensions and did not let things heat up further, and this dialogue-driven initiative of Pakistan had earned accolades from the world leaders, he added. He also welcomed Iran’s offer of mediation between Pakistan and India over the Kashmir issue. The UN Secretary General Ban Ki-moon had already made such offer but India did not want to address the lingering issue and always declared it as a bilateral issue, he said, adding it was done as ploy to forestall any development. The advisor said after the July 8, with the martyrdom of Wani, an Intifada was launched by Kashmiris against the Indian oppressive rule which had baffled the Modi’s government. He lamented the inhuman use of force by the Indian occupation forces against the Kashmiri people in the Occupied Kashmir. He reiterated that Pakistan would continue to highlight Kashmiris’ plight at the world fora by extending moral, political and diplomatic support to their just cause. Responding to a question related to permission of land trade route to India linking Afghanistan, he said under such scenario, it was not possible to give concession to India. He categorically stated that India had already suspended the connectivity frameworks. About Heart of Asia conference held in India, the advisor said India gave a very negative message to the world with its repeated flimsy Pakistan-bashing. With Afghanistan, it targeted Pakistan and tried to create a chasm between Pak-Afghan ties, he said, adding Pakistan would not let it happen as it enjoyed multifaceted ties with Afghanistan spanning over centuries. Sartaj Aziz replying to a query, said that he was surprised at Afghan President Ghani’s statement during the conference as prior to it, they had held a very constructive meeting. He noted that such reaction indicated an unrealistic approach by the Afghan leadership as it was confronted with very serious and complex issue of unrest and insurgency on its soil. It might be the cause of frustration and failure on part of the Afghan leadership which was instigated by India, he opined. However, he clearly ruled out any serious crises in Pak-Afghan ties and expressed his optimism that soon there would be interaction at the highest levels. The Advisor said during the conference, Pakistan’s role for regional peace and prosperity was endorsed by China and Russia. They had noted that Pakistan’s role was indispensable in bringing stability in the region. Sartaj said across the globe, terrorism was on the rise, but Pakistan during the last three years had made strides in stemming the curse. Pakistan’s policy was very clear in that regard and it had given priority to fight terrorism and was moving in the right direction under the National Action Plan, he added. Sartaj said Pakistan’s growing relations with Russia had also worried India, adding Pakistan was forging stronger ties with all the major world powers. Responding to another question, he said in recent times, throughout the world, there was emergence of nationalistic agenda due to which the world had shifted it focus on South-South Cooperation in which China Pakistan Economic Corridor held the massive prospects for regional cooperation, connectivity and prosperity.